This little dress is a bit of frippery that was fun to put together but you certainly wouldn't want to be too particular about it. However with the stretchy fabric you can get away with a lot! I thought this was really cute but did not want it in black. I emailed Knitwit in Perth as the article notes that they supply the fabric, but received no reply... they obviously don't need the business. By chance I came across the fabric when we stopped at Kerryn's Fabric World. This was a total chance encounter as I only had 5 minutes to browse before the shop shut and I spied it while I was standing at the counter to pay for my purchase. It was obviously meant to be! The dress modifications are outlined in the article, but basically you use the collar without a fold-over (halve the collar height), take out the gathering at the neckline and shape the pieces more, including putting darts in the back. I also had to narrow the pattern pieces more than indicated at the hemline to fit it on my fabric (I only bought 1.2m). This caused no problems though as the fabric is so stretchy it is very forgiving. The main difference in mine to the one in the magazine is that the collar does not sit so close at the neckline. Mine sits looser like the McCall's pattern so I think they adjusted their version but did not note it in the article. It is not worth trying to alter as it would be impossible to unpick this fabric. I really like this dress but I do feel a little like Wilma out of the Flintstones! My husband did not take a full shot showing my pretty leopard print shoes as the grass hadn't been mown and was up around my ankles! The back slit is also so long my bra peeks out at the bottom of the key-hole - you can see it in the back shot if you look closely. I think I will do a simple fix and just stitch it by hand to close a little higher. This is a detail shot of the buttons on the back of the collar. I used the buttons you cover and found a piece of lining fabric in a similar shade. It works, I think. 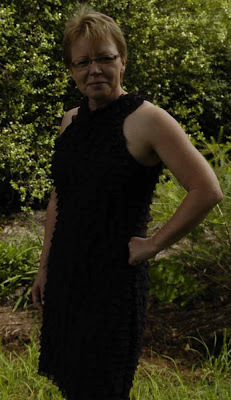 This dress is going to get it's debut at a race day that we are sponsoring a table at (and a race too, I think) These fundraiser days are held in a Marque at the twilight races. Good fun and a chance to frock up! Hopefully I won't see anyone else in my dress! That dress is gorgeous! I love the racer effect and will probably copy except for the fabric which I know I won't be able to find. You did a fantastic job. That is a totally cute dress! You have the arms to show it off perfectly. Great looking dress and you will have to get a photo of it with your leopard print shoes. Great fabric! is that a knit? I think that I bought some similar fabric last week in Los Angeles. The dress looks lovely! I'm glad you posted--you have given me a great idea! what amazing fabric and check out the hot bod! You're such an adventurous sewer - and what a perfect occasion to take a risk and do something completely different - no chance of seeing the same dress, I'd put money on it! Both your new dresses are way cute. I totally agree you will not see anyone else in that gorgeous dress. Thank you for the lovely compliment on my dress. Really cute dress, it looks great on you! Wow, you look awesome in that dress! That fabric is so cute, just love it! 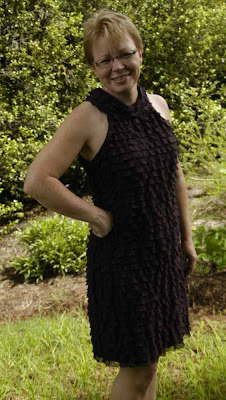 Love your dress, I have a casual jacket in this fabric and just love it as you say so forgiving. Awh! Where's the shoes? Lovely dress - the fabric is really interesting. Fits you beautifully too. What a fun dress! The changes make it more sophisticated. Very cute, I love the fabric. This is super hot, in a cute way! Great job. What a gorgeous dress! That fabric is such a show-stopper, it is a perfect choice for a simple pattern. Beautiful work! Style... fashion.. or is it just comfortable?